As you know, I’m an independent cartoonist using the Web as the primary distribution for my work. I don’t work under a syndicate, and I don’t have an employer in the traditional sense. Actually. You’re my employer. You and a few thousand others who stop by and read the comic on a regular basis. Thank you, by the way. You’re the best bosses I ever had. And in the same way a good employee doesn’t want to do anything to tick off his or her boss, I need some information. You see, I use social media, like Facebook, Google Plus and Twitter, as the primary means of publicizing and promoting my work. Its the most effective means I have of growing my small business. And Facebook has long yielded the best results. 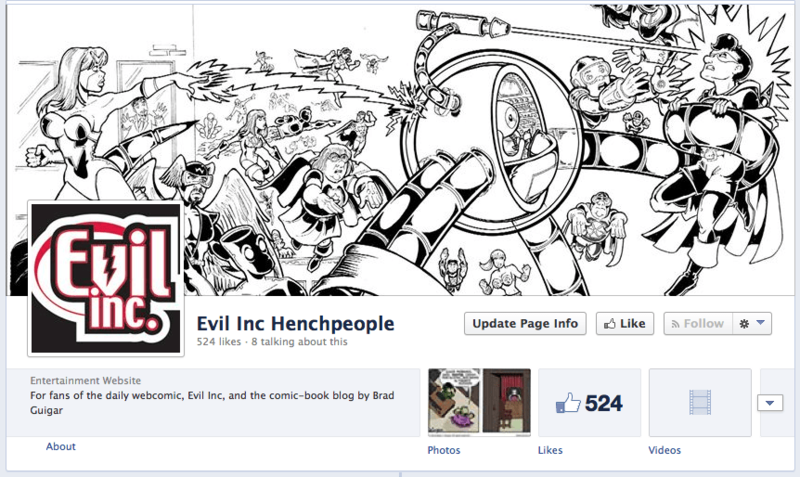 I have a Facebook Fan Page for Evil Inc called Evil Inc Henchpeople. The comic is posted there regularly, as are features such as “This Day in Evil Inc History.” I post secret codes for discounts on Evil Inc merchandise from time to time, too. And little asides and background information. It’s actually a great place to get an expanded view of the Evil Inc universe and converse with other readers. And I hate hate hate getting those invitations. But I’m a curmudgeon — given to fits of crotchetiness that would make your head swim. The important thing is this: Do you hate them? ‘Cause I’m telling you right now, I’d really like to expand the reach of that Facebook page. But it’s going to take people “liking” that page. And that means inviting them to “like” the page. See the dilemma. I wish I could help you, but I have no interest in Facebook, so I have no account there. Yeah, same as Commander Balok, I’m a Social Networking refusenik. So, er, go wild with the invites, I guess? I’m going to go for option C – I’d rather cut off my own face with a potato peeler than make a Facebook account. It would be like inviting the city council to build a leaky sewer pipeline through my office and hooking it up to my monitor somehow. I don’t use Facebook, Google Plus, Twitter, or any other social media, sorry. And after the recent hacks, I’m not going to. Based on the comments here I suspect Evil Inc will be getting a new employee: Zuckerman – special power mesmerising people into giving him all their secrets so he can sell them to the highest bidder. Neither choice really fits my opinion. I pretty much ignore such invites, so a “meh” option would be my choice. I’m not really active on Facebook, though. That’s were my ultra-conservative relatives and the people I sorta-kinda knew in high school hang out. They post a hell of a lot of snopesbait. I like Google Plus better for following people I may not know personally, but they seem cool and I’m interested in what they have to say. I also avoid the drama of having my super religious aunt see that I’ve “liked” a post by Evil Inc, Hell Inc, Sinfest, Devilbear, etc. Man, I have quite a few evil-sounding web comics in my favorites. “Snopesbait!” I’ve never heard that term before, but I love it!